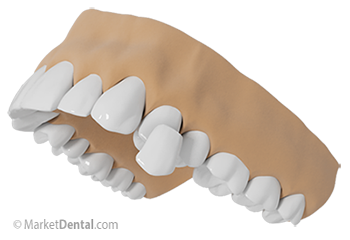 Veneers are routinely used to cover teeth which are discolored, worn, chipped, or misaligned. Veneers are used for many of the same reasons as bonding but they involve a different procedure. If you are looking for a dentist in Calgary to find a solution for worn or misaligned teeth, give Fairmount Dental a call at (403) 454-0054 and Dr. Marius Caragea can help you find a solution. Veneers are thin shells of porcelain or resin. First, Dr. Marius Caragea will prepare your tooth and then take an impression of the prepared tooth, possibly place a temporary restoration in the space, and send the impression to a dental laboratory to have the veneers manufactured. Typically veneers are difficult to stain, making veneers a very popular solution for many people seeking that perfect smile. Strong and very durable, veneers last for years, and come in colors that will brighten dark teeth without the worry of them changing colour. Call Fairmount Dental in Calgary for a consultation with our dentist Dr. Marius Caragea regarding Veneers.